Volunteer for Ongoing Events: Concert in the Park (June 15, 2018 sponsored by Winona National Bank), the End of Summer Block Party (August 8, 2018) and Give to the Max Day (November 15, 2018). The next scheduled meeting of the Friends is 6:30 p.m. on Tuesday, April 9th, 2019 (Annual Meeting). Beginning January 2019, meetings will usually be held on the third Saturday of each month from 9:30 – 10:30 a.m. usually in the Bell Art Room of the library. All Friends and potential Friends are welcome to attend. Meeting Minutes are posted after formal approval. Please join us on Tuesday, April 9th, 2019 in the Central Exchange Room at 6:30 PM. Winona author, Gary Evans, will be speaking at the Friends of the Winona Public Library Annual Meeting. Evans is the author of popular books Death by Drowning, Death by Poison, and Death by Payback. Each book follows Detective Al Rouse and Sheriff's Deputy Charlie Berzinski in their hunt for serial killer Genevieve Wangen. The story begins with the hunting drownings of the young men in La Crosse, WI. The Friends will be proposing changes to the existing bylaws which can be viewed here. Fine Waiver Card - This card can be used once on any fine from $0.10 to $5.00. $5 Book Sale Shelf Certificate - This card gets you up to $5 of items from the book sale shelf in the library. 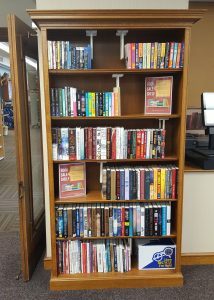 The Friends of the Winona Public Library will join charities and schools in Minnesota for the annual Give to the Max Day through giveMN.org. All donations to the Friends directly benefit your library. Visit the Friends of the Library's page at giveMN.org to make a donation on Thursday, November 15th. Need a gift idea? Looking for a good deal on a book? Stop by the Friends Book Sale Bookshelf located next to the self-checkout station in the main entrance area of the library. The shelf is stocked with hardcover books, paperbacks, compact discs, and movies. Stop by often as items on the shelf vary daily. All proceeds benefit your Winona Public Library.